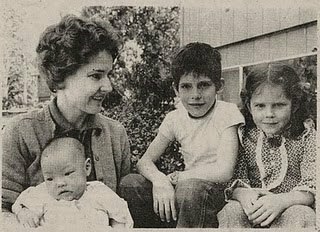 An old penpal, also an adoptee, reminded me that this week marks the 35th anniversary of my arrival into the U.S. and my family. 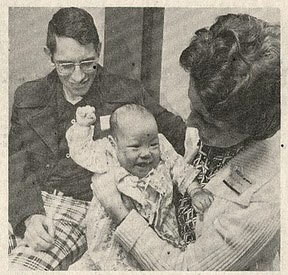 At four months of age, I was flown out Saigon, along with a few thousand other babies as part of Operation Babylift. My parents, who had been waiting over two years to adopt a baby, drove up to Seattle and waited through the night, along with hundreds of other expectant parents, to meet their new little ones. It’s never bothered me in the slightest that I look nothing like either Grandma or Poppa. Or anyone else in my family, for that matter. I firmly believe that family is defined by who you are loved by. And we had love o’ plenty growing up. That being said, since my kids’ births, I have to say I’ve felt a biological tug on my heartstrings I’ve never really experienced before. There’s something pretty sweet about looking into a little face that resembles parts of you and your better half. Chip and Bobo both inherited the crazy, stick-your-finger-in-a-lightsocket hair I had when I was little, my husband’s nose, and big brown puppy dog eyes that are a mixture of both their parents. Bobo especially takes after me. It’s almost surreal to hear someone gush, “Oh my gosh, she looks JUST like you!” I sometimes stop and do a double take before I realize, “Why, yes, she DOES look a lot like me.” It’s a relatively new experience for me to actually look like members of my family. While my kids can’t credit their wild hairdo’s to Grampoppa, they have inherited something infinitely more valuable. The attributes I try (emphasis on the word “try”) hardest to emulate as a parent are ones that I observed and experienced directly from my own upbringing. My dad’s silliness. My mom’s constant encouragement. Tolerance and patience (oh, I wish I had more of it some days). The ability to laugh and cry in front of your kids, and the belief that you can never tell your kids you love them often enough. Previous Previous post: What’s worse than smelling like poop?